When it comes to media measurement, many companies these days confuse the simple process of media monitoring with the goal-oriented and methodical process of media measurement. As a standalone tool, media monitoring provides little value if utilized as the only “measurement technique.” Media measurement supported by media monitoring, on the other hand, helps you monitor, benchmark, and analyze your company’s media coverage to ensure that it is fair and accurate, occurs on a regular basis, and is in line with your overall communications strategy. To be able to derive that from your monitored media, it is important to ensure that your measurement roadmap is a) aligned with your business objectives, b) has broad communications goals, c) supported by specific objectives that are realistic and achievable, and occur during a specific timeframe. Defining your communications goals and objectives is a time- and effort-consuming endeavor, and should take into consideration your overall strategy, your audience, and your desired outcome. At the end of the day, however, it is the specifics of your effort that allow you to see whether or not you have accomplished what you set out to accomplish. If, after completing the full cycle, you realize that your program did not reach those objectives, then you should revisit your goals and objectives and identify the areas that need improvement. Your evaluation effort should be an ongoing and continuous study of your communications programs, and not just a retroactive narrative of your past coverage. The important thing to keep in mind is that your measurement program is not set in stone, but rather, is a living and breathing document that changes as your needs change, and requires a long-term commitment and investment in order to ultimately change perceptions, attitudes, and behaviors. 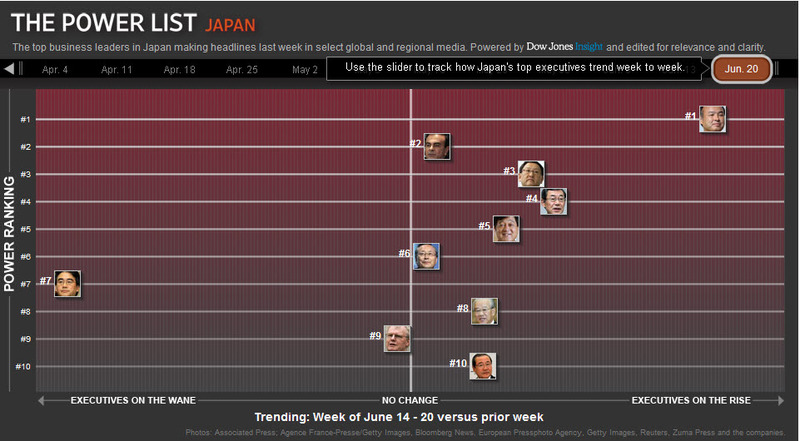 WSJ.com recently launched a cool, interactive graphic that shows how the media coverage of top Japanese executives wax and wane over time. Powered by Dow Jones Insight and edited by the WSJ team, the graphic links to bios of executives and a list of news stories that are driving the coverage. How Well Does The PR Industry Promote Itself In Asia Pacific? How effective are the region’s leading public relations firms at promoting and managing their own brands? 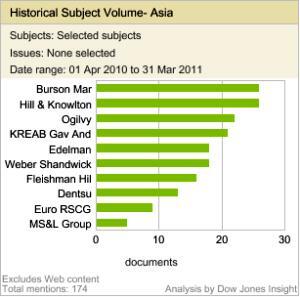 Using the Dow Jones Insight media analysis tool, Dow Jones measured the media coverage of the world’s public relations firms, compiling a list of the large firms that generated the most media attention in Asia Pacific for the past 12 month of April 2010 to March 2011. Of the firms examined in the region, Burson-Marsteller, Hill & Knowlton and Ogilvy PR drew top media coverage volumes. This analysis measured large PR firms’ coverage in traditional media outlets. Interestingly, out of these top three only Ogilvy got awarded by The Holmes Report’s recent Agency-of-the-Year ranking – in the “Digital Consultancy of the Year” category. Dow Jones designated firms with more than $50 million in annual fee income as large. For this first-of-its-kind analysis, Dow Jones Insight compared English media coverage for the key Asia Pacific markets Australia, Hong Kong, China, Taiwan, Japan, Korea, India, Singapore, Malaysia in the past 12 months. Solely negative, issue-related media coverage was excluded. Lars Voedisch is a media consultant based in Singapore. Facebook is the largest social network globally – so that’s where your company has to be. And quickly add Twitter as well as everybody is talking about it. Come on, rush out and set up a page! Or not? One of the biggest mistakes companies do when it comes to social media, is to rush in without a clear objective and combined with that not understanding their respective social media universe. So while Facebook might be the right bet for some, for others it could be specialist blogs, topical forums or starting with getting your corporate website up to speed. Your multiple online presences have to be carefully chosen after getting to know where your target audiences really are – which is a given for the traditional media landscape: or would you try to reach customers of high-voltage switch boxes in a teenage fashion magazine? Hence, a sincere social media audit is the first step of any engagement or outreach programme: Where are relevant conversations happening? This means not only to look out for your brand and competitor mentions, but even more: where are people talking about topics that are relevant to your business? E.g. when you are selling life insurances, you would find many related discussions in online forums of soon-to-be parents who are thinking to safeguard their offspring. So after starting with monitoring your social media environment, the next step would be to analyse more in-depth the kind of conversations, their tonality, topics, issue etc. before actively engaging. When you do this, you might be surprised, how many of your own employees are already active in the social media space. Are you actually encouraging them to be brand ambassadors or do you have guidelines that rather want to limit their social media engagement? Unfortunately, too many social media guidelines are written like a penal code and – similar to employee handbooks – are never read beyond the cover page. It drills down to the overarching question: What is your organization’s objective to achieve in and with social media? And as a consequence of this: who in your organization should be involved in your online strategy: Is it just Marketing or PR? Or should HR take a lead? What’s IT’s role in this? While you might still be wondering which approach might be the right for your company, rest assured that your stakeholders are already discussing your brand, your products, your industry – maybe without you. Lars Voedisch is a Dow Jones media consultant based in the Asia Pacific region. He can be followed on Twitter at @larsv and @dowjonesinsight. It’s easy, I think, to draw conclusions from a quick scan of headlines. Sometimes what we intuit can be right on the money, but other times, a deep look at data can challenge our perceptions. Every day, I give a cursory read of several local and US national papers and web sites, and based on this, my take on the economy has been mixed. There are bright spots and not so bright spots. Luckily, there are a number of economic indicators that can give me a more accurate read. Yesterday, the Dow Jones Economic Sentiment Indicator hit its highest level since June 2008, up a full two points from last month to 42.3. What’s interesting about this indicator is that it’s calculated by analyzing the economic coverage in 15 major daily newspapers in the U.S., using Dow Jones Insight. This is the same media analysis tool used by Fortune 2000 PR and corporate communications teams to measure their media coverage. So, rather than simply rely on my own amalgamated view of what the news says, I now have a serious – and more reliable – way to evaluate all the economic news running in these papers (more than I read, actually). Changes I’d often overlook – for example, an increase in boat sales in Chicago – are factored into the indicator. Neal Lipschutz, senior editor at Dow Jones Newswires, explains how this indicator works on Fox Business. Diane Thieke is Marketing Director, Dow Jones Solutions for Communicators, based in Princeton, NJ.